I've only heard good things about this movie, so it's been on my radar. Then it got all those nominations and Grandma J's heart starting beating fast. Well no real fast, but since this movie has already been out for a couple of weeks, just the thought of missing out on this movie raised her anxiety level. This part of the movie should be good. 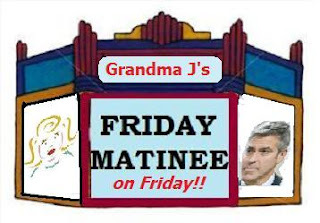 Just a wild guess, but Grandma J would think any part of a movie with George Clooney is good. Back at you later with the review! I've been looking forward to this one too. Hope it's a good one. I'm sorry. Did Grandma J. say something? I didn't hear because I was too focused on George's feet, calves, knees, thighs and well I was distracted. I can't wait to hear your review. Miz Booshay liked the movie you didn't like with Sarah Jessica Parker better than this one. She is the first person I heard say that though. : ) Anxiously awaiting your review! aaaahhhh George! What a hunk.